Prepared daily, this report gives you access to properties as they come on the market. Finding a property that suits your needs, time frame, and budget is always our goal. WHAT SETS PFEIFER REALTY GROUP APART? Give us a call anytime to discuss your real estate goals and how Pfeifer Realty Group can help you achieve them. Since we opened our office in 2008, our listings have sold 22% faster than all other island sales. 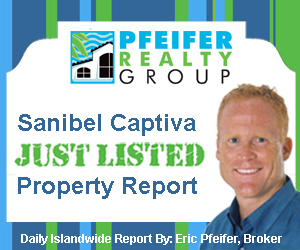 From May 1st 2008 thru August 18th 2018, Pfeifer sales averaged 213 days on the market vs. 274 days on the market for all Sanibel and Captiva sales. Over the years we have streamlined our listing, marketing and closing procedures to produce faster results for island property owners. Is it only Pfeifer Marketing that sells our listings faster? No, there are many other factors involved. Pfeifer Realty Group strives to make it easy for other agents to sell our listings. We try to anticipate all the relevant information a future buyer would want including: insurance, elevation certificates, surveys, property disclosure, rental history, future bookings, updated property taxes, floor plans, monthly expenses, association documents, inventory and any other information that can speed up the due diligence process. All Island Listings Days on the Market (DOM) include Pfeifer Realty Group’s quicker sales in the average DOM. When Pfeifer's quicker sales stats are removed from the All Island DOM, the actual average days on market for our competitors goes up. Our quicker sales boost the average of all other island Days on Market. Listing Coordinator: schedules Professional photos, video content, inventory, and data entry. Marketing Experts: enhances your property as it saturates the internet. Open House Coordinator: should our seller want open houses we schedule and market them all in advance. Showings & Feedback Coordinator: Our listing agents accompany showings and office staff gathers and reports feedback to our property owners. Client Care Coordinators: Meeting frequently on behalf of our clients this team facilitates all aspects of a property sale. Closing Coordinator: Once your property goes under contract, having a team of experts behind you is critical. Our closing coordinator organizes all milestone dates and deadlines, schedules inspections and surveys (if needed), obtains and delivers reports, HOA documents and all other required paperwork. We strive to make the closing a smooth process without delays, for all parties involved. Getting to the closing table on time and smoothly requires diligent organization. The Pfeifer Team is diligent, organized and ready when you are. Since we opened Pfeifer Realty Group in 2008, our listings have closed faster for the same list to sell ratio than other island properties due in large part to streamlining the process. We make it easy for other agents to show and sell our listings ensuring that our sellers get to the closing table efficiently. We are proud of these results and strive to improve our efficiency every day.